I've had many projects over the years, the most involved by far has got to be my DIY projector. It is also my first serious project. By the end of it I had vastly improved my knowledge of optics, electronics, woodworking, and even a little thermal dynamics. The major problem with these sorts of projectors is that they tended to be very large. 1080p monitors at the time tended to be at least 19" diagonal, which meant the entire box would need to be 3-4 feet long! Fortunately there were a few entrepreneurial types who started sourcing LCD screens that were smaller and ideal for DIY projection and selling them directly from the manufacturers. I managed to get my hands on one such monitor that was only 10.6" and had 720p resolution. 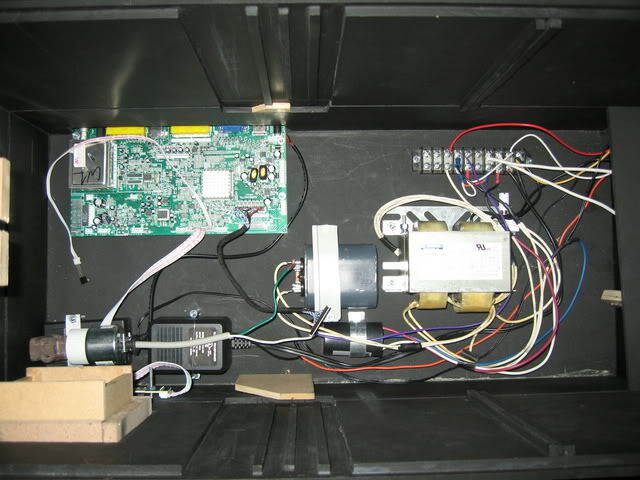 With the LCD picked out I was able to begin designing the enclosure around December 2007. Other than the LCD, the most important component is the light source. Some of the brightest bulbs consumed 400 watts of electricity or more, and had very impressive results. But with such high powered bulbs came a lot of heat that needed to be dealt with. I ended up going with a smaller 150 watt bulb. The final pieces were the fresnel lenses and the projection lens. These were a fairly standard item and lumenlab took a lot of the guess work out of things by selling them from their store. My final design to incorporate all these parts was a two chamber design. The top chamber had the optics. 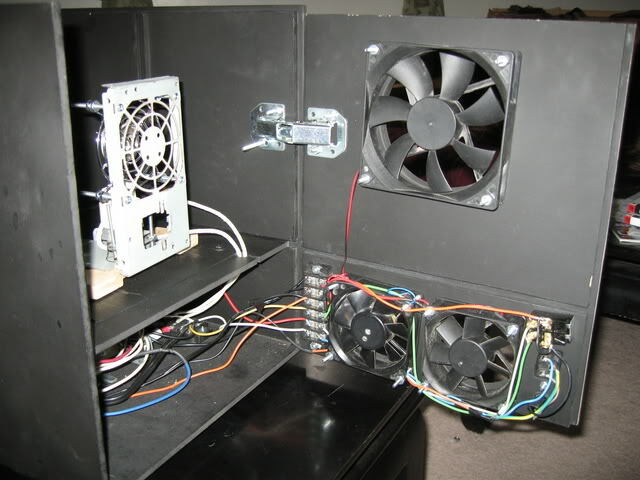 The bottom chamber contained all of the electronics: The LCD controller, the light bulb components (transformer and starting capacitor), and AC adapters and a heat sensitive trigger which would keep the fans running until the heat in the box dropped far enough. 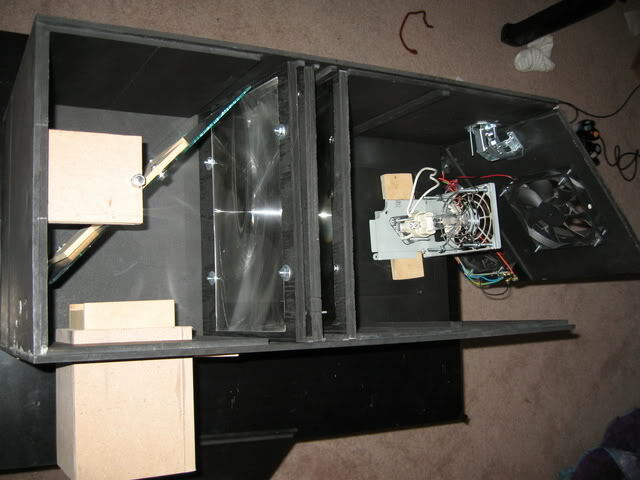 The enclosure was designed to be simple to build and easy to assemble. The parts were cut on my dads table saw, and pieces were laminated together so that components could slide in and out of the enclosure during assembly. This design worked nicely. 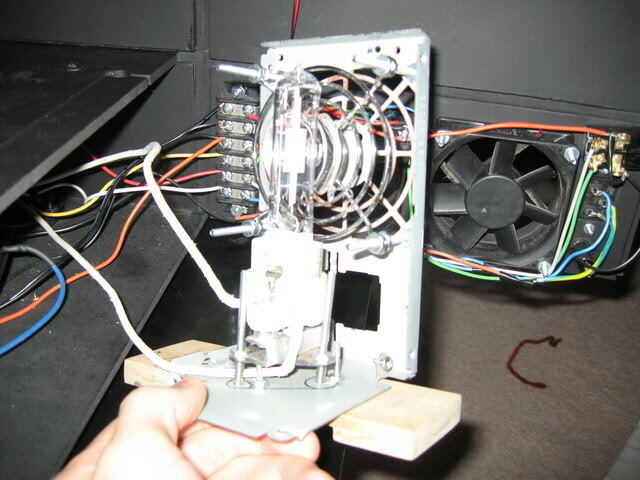 In this picture you can see all the electronics (minus the thermal switch) and the various slots for the LCD, fresnel lenses, and chamber separators. 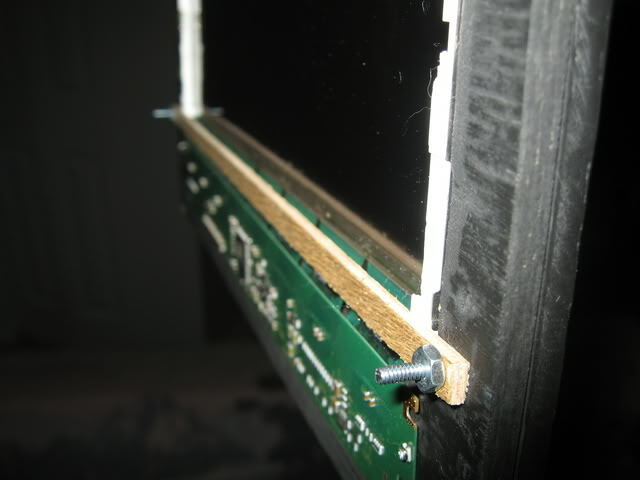 The LCD frame had special protection for the delicate flexible cables of the monitor electronics. 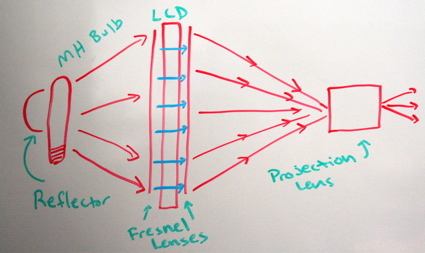 The frames for the fresnel lenses were similar. 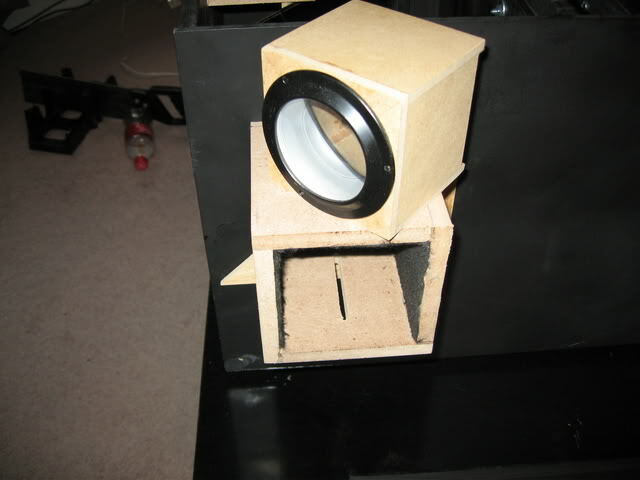 The light source needs to be precisely positioned for the light to focus properly, so this box was built with rare earth magnets on the bottom. It attaches to a metal plate in the box which can be seen in the upper left of this photo. The back was hinged so that adjustments could be made as needed, here you can also see the light box in place. The triplet lens is another clever mechanism I came up with, by building the box a little loose I was able to pad it with felt so that the lens carriage could slide in/out but still be held snugly in place. The slot at the bottom was for a holding screw, but ended up being unnecessary. Fully assembled, on the left is a front surface mirror which allows the box to be 11" deep instead of nearly 30. The final result is big and ugly, but it worked and I used it for years. I'll never forget how surprised my girlfriend was when I plugged it in for the first time and an image, apparently she thought I was crazy for those 5 months. In the end it really did work nicely. Designing it was a lot of fun, but my craftsmanship really limited my options. Hey Will. I am looking for a video projector. Do you have one you would like to sell? I saw one on craigslist a while back.